These don’t look so purple on their own, I guess, but if you saw these as I first did, next to many other varieties of sage, you would be able to see that they are pretty purplish. Look at the stems and veins. There it is. OK; keep that sage in mind for a minute while I talk about the weather. It was really snowing here in New York yesterday, and not just a little, but the picture I posted was taken in February. It is pretty cold too. Not as cold as it is in Deering, but cold enough that you want tea at all hours. I’ve been making sage tea while weathering the blast. The Yiddish recipe is here, but today I picked up this purple sage from the Stannard Farm stand at the Farmers’ market near Columbia University, which I recognized from Paz’s pictures, so I think it would not be too grossly redundant to post another recipe, this one in English, using the purple stuff. Combine ingredients in a large mug and pour on boiling water. Tonight’s tea was just the sage. Yesterday’s had oranges, lemons, ginger, and honey as well. I humbly offer both for Weekend Herb Blogging. Oh, and one other thing: I do not recommend making tea from chervil. Just saying. Oh, wow! This is great! I've never seen purple sage there before. But then again, I didn't know anything about purple sage, until now. Thanks for posting this! Let me know when you're in the neighborhood next time! I've never tried making tea from sage, but I bet it's great. I have some sage in my garden that comes back quite faithfully every year and I keep meaning to make fried sage like you see in the fancy cooking magazines. Sometime before the end of 2006 I'm going to be coming to New York and I want to have dinner or lunch with you, Paz, Mona, Rose, and any other NYC food bloggers that you guys have discovered by then. Hmmm, this sounds interesting. 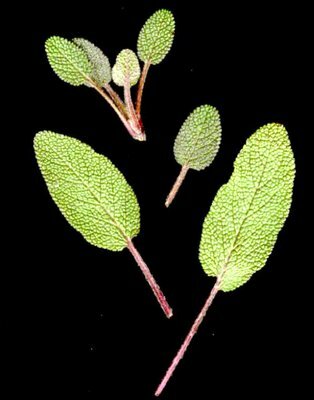 My mother used to make thyme tea for me when I was little, but I've never thought of using sage. I must try it, though! The purple kind is particularly pretty.